The Lifesaving Service is considered a sister organization to the Lighthouse Service, and in many locations a lifesaving station and light station ended up being next-door neighbors. 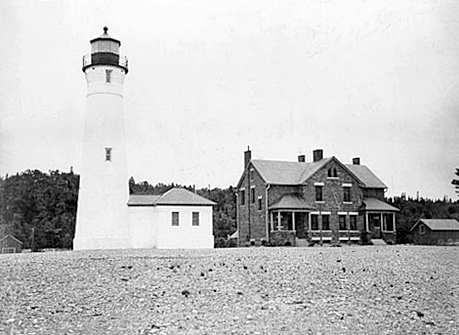 In 1876, four remote lifesaving stations were built along the “Shipwreck Coast” of Lake Superior, between Whitefish Point and Grand Marais. From east to west, these stations were Vermillion, Crisps Point, Two Heart River, and Deer Park. Crisps Point Lifesaving Station was originally known as Station #10, but it later took the name of Christopher Crisp, its second keeper, who served there from 1878 to 1890. As happens with a lot of places named after a person, the name has morphed over time, changing from Crisp’s Point and Crisps Point to the now more common Crisp Point. This is a dangerous point for vessels bound down the lake in thick weather. These vessels all try to make Whitefish Point, but a slight variation in their course from the nearest point of departure will run them ashore near Crisps Point. Several wrecks have occurred here. The Board repeated its request each year until Congress appropriated $18,000 for the station on June 28, 1902. A site at Crisp Point was selected and surveyed and a title to it obtained in August 1902. Plans and drawings for the station’s buildings were prepared, and the necessary metalwork and construction materials were delivered to the Detroit lighthouse depot so they could be shipped north during the 1903 season. The barn and boathouse were framed at the depot before being transported to Crisp Point. Crisp Point Lighthouse is a circular, brick lighthouse that stands fifty-eight feet tall and gracefully tapers from a diameter of fourteen feet at its base to nine feet before flaring out to support a gallery that encircles the tower’s octagonal lantern room. A redbrick, two-story duplex was built sixty feet west of the tower for the head keeper and his first assistant, and a small, one-room, ten-and-a-half by sixteen-foot house, painted maroon, was built for the second assistant. A rectangular redbrick building was erected on the shore 100 feet north of the tower for a ten-inch steam whistle. Besides the barn and boathouse, other outbuildings included a brick privy and brick oil house. Nearly the entire station was finished when work closed for the season on December 18, 1903, but a work crew did return the following May and wrapped things up on June 10, 1904. I took charge of the station today at 10:30 and found the station in good condition or as good as could be expected under the circumstances. As the floors of the dwelling are not finished, decided to live for the present in the workmen’s quarters. Capt. Hunter of #10 station has shown every kindness possible and gave a very cordial welcome. After receiving word from Whitefish Point, Keeper Smith and his assistants exhibited the fixed red light from the station’s fourth-order, Sautter, Lemonnier & Cie. Fresnel lens for the first time on the night of May 5, 1904. 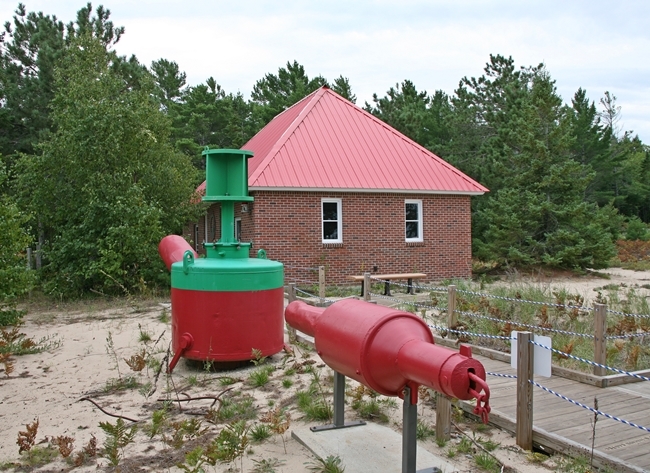 In 1905, the machinery for a second fog-signal plant was installed, and a ten-inch chime whistle replaced the original standard whistle so the tone at Crisp Point could be distinguished from that at Whitefish Point. At the same time, a brick service room was built and connected to the tower by a passageway, and 750 feet of cement walks were laid. In 1907, a landing crib, twelve feet wide and 132 feet long, was built on the west side of the boathouse, filled with stone, and decked over. On September 4, 1914, the intensity of the light was increased, likely by changing the illuminant to incandescent oil vapor, and on November 15, 1915, the characteristic of the fog signal was changed to a ten-second blast in each minute. Previously, the characteristic had been the repeated sequence of: a four-second blast, ten seconds of silence, three-second blast, ten seconds of silence, three-second blast, and thirty seconds of silence. 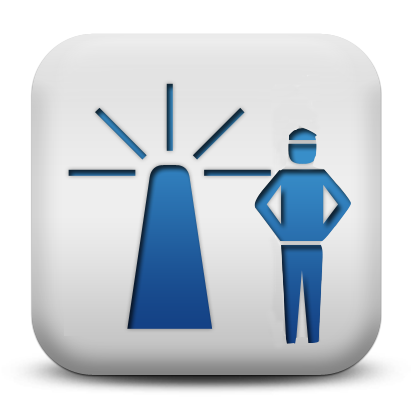 In 1933, the fog signal was changed from steam power to a six-inch siren operated by air compressed by a diesel engine. Although there was a lifesaving station on the point, that didn’t prevent Keeper Herbert Crittenden from helping those in distress on Lake Superior. In 1921, Crittenden was acknowledged for having towed the disabled motorboat Gladys to shore with four people aboard and for having helped the motorboat Sea Fox during a severe gale. 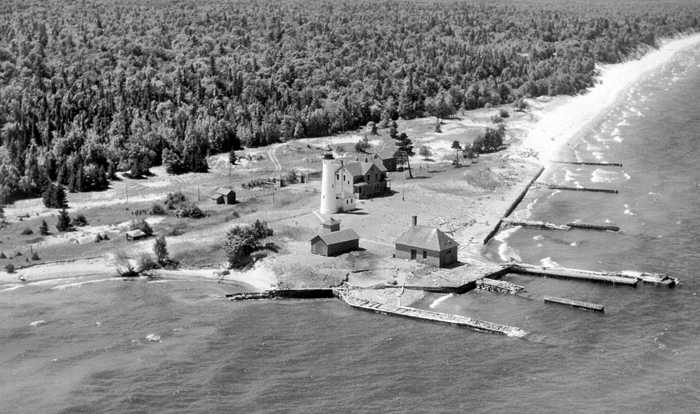 Before arriving at Crisp Point in 1921, Keeper Crittenden had served as head keeper at Gull Rock and as an assistant at Whitefish Point. Aerial view of station in 1935 – note fog signal building and shore protection. Keeper Joseph Singleton retired from Crisp Point in 1939 after thirty years in the Lighthouse Service, which also included stints at Charity Island and Two Harbors. While Joseph and Martha Singleton lived at Crisp Point with their four sons, known as the “lighthouse kids,” the family became well known as trappers, hunters, and fishermen. Though the Singleton sons earned their livelihood in this manner, it was their mother who caught a thirty-one pound trout while trolling six miles off the lighthouse to win a fishing contest in 1939. Tom Singleton, the second oldest of the sons, remembered standing watch with his father on the night of November 5, 1925, when the steamer Herman H. Hettler, towing the wooden barge Crane was battling the lake just offshore from the lighthouse. Tom went out and stuck two sticks in the beach so they could tell if the steamer was making any progress – she wasn’t. Tom and his father would alternately see the lights of the steamer and the barge as they crested the waves, but after a while only one set of lights was seen. The Crane had gone down in twenty-five feet of water with five men and one woman. One year a government construction crew working at Crisp Point helped seventeen-year-old Tom build a twenty-four-foot fish tug that he named Laugh’s Dream. More than once, he and his brothers had to beach the tug during a fishing expedition to escape the furry of Lake Superior. On one of these occasions, Tom and Jack Singleton made for the Two Heart Lifesaving Station so the crew could help them get ashore. When the tug struck bottom, the brothers dove into the water with an oar to help them stay afloat. That night the keeper of the Two Heart Station called the boys’ father and said, “I wish them damn boys of yours would drown and get it over with. We’re tired of pullin’ them out of the lake.” The lake never did get Tom, as he was eighty-five when he related this story. Keeper Singleton would often rib his wife about the thirty-five acres of shoreline she purchased on Lake Superior that had been whittled down to just ten, but erosion was a serious problem at Crisp Point. Shore-protection groins were built perpendicular to the shoreline to help build up the beach, but they were often damaged by ice and pounding surf. When Keeper Singleton retired at the end of the season in December 1939, he was able to drive to his home in Newberry without snow for the first time in all his years of closing the station. The Singletons did not leave Crisp Point for good, however, as they returned to the point as soon as the snow melted the next spring to live in their private cabin. After two years of planning, Crisp Point Lighthouse was electrified and automated in 1941. In addition, an electrically lighted bell buoy of 1,475 candlepower was established 10 degrees from Crisp Point in seventy feet of water, near where steamers changed their course, and the fog signal was discontinued before the last keepers were withdrawn. In 1965, the Coast Guard razed all the buildings at Crisp Point save the lighthouse and its attached service room. 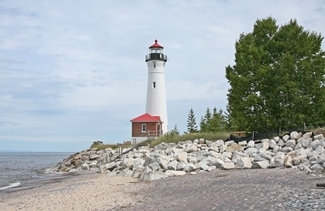 Don and Nellie Ross stumbled upon the abandoned Crisp Point Lighthouse in 1988, and were so inspired by it, that they moved to the Upper Peninsula from Ohio, formed the Crisp Point Light Historical Society, and launched an effort to preserve the tower. Their timing was perfect, as the Coast Guard decommissioned the lighthouse after the 1992 season, making it easier for the society to get a lease for the tower in 1994. Just how close Crisp Point Lighthouse came to being lost is evidenced by the destruction of the service room at its base by a violent storm in November 1996. 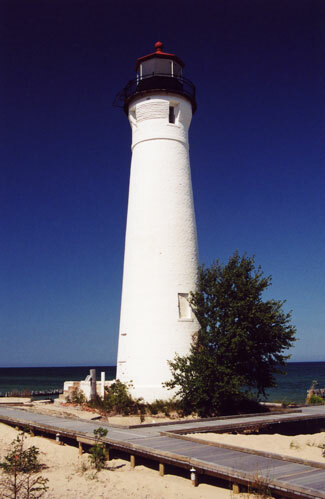 The lighthouse was transferred to Luce County in July 1997, and the following year, the society spent $42,000 hauling in stone to protect the tower. Work on a new service room began during the fall of 2006, with its roof being installed the following year, and its interior being finished in 2008. A redbrick visitor center, which resembles the station’s fog signal building, was built inland from the lighthouse in 2009. In 2012, Crisp Point Light Historical Society received a permit from the Coast Guard to operate the light as a private aid to navigation. A 300mm lens was installed in the lantern room on November 23, 2012 and will be active each year between May 1 and November 1. Don and Nellie Ross passed away before Crisp Point Lighthouse was reactivated, but the tower’s beacon is an enduring reminder of what two determined people can accomplish. Head: John E. Smith (1904 – 1906), Herbert N. Burrows (1906 – 1910), George W. Smith (1910 – 1911), Jacob H. Gibb (1911 – 1913), Peter Coughlin (1913 – ), Norman P. Hawkins (at least 1915 – at least 1916 ), Herbert P. Crittenden (at least 1917 – at least 1921), Joseph N. Singleton (at least 1924 – 1940), Albert F. Brown (1940). First Assistant: William J. Gramer (1904 – 1907), Roger W. Campbell (1907 – 1912), Albert E. Haskell (1912 – at least 1915), Philip F. Eby (at least 1917), Lewis N. Clarke (at least 1919 – at least 1920), Edward T. McGregor (at least 1921 – at least 1924), Albert F. Brown (1930 – 1940), Herbert Winfield (1940). Second Assistant: Charles H. Basel (1904), Lloyd H. Robins (1904), H. Winfield (1904), John A. Maguire (1905 – 1907), Norman P. Hawkins (1907 – 1909), Samuel Massicotte (1909 – 1911), Archie Hetu (1911 – 1913), Joseph J. Taunt (1913 – ), Harry F. House (1915 – ), Edward L. Hall (at least 1917), Robert G. Somes (at least 1919 – at least 1920), Albert F. Brown (1921 – 1924), Hazen A. Dodd (1924 – ), Herbert Winfield (at least 1930 – 1940). “The Lighthouse Kids of Crisp Point,” The Keeper’s Log, Summer, 2000. 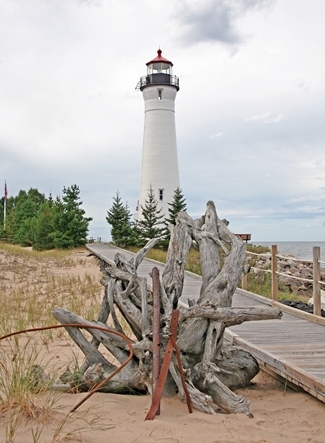 Located at Crisp Point on Lake Superior, roughly fourteen miles west of Whitefish Point. 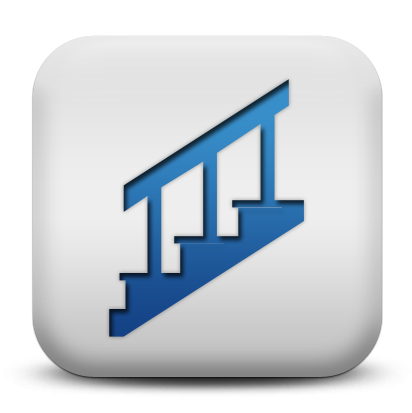 For a larger map of Crisp Point Lighthouse, click the lighthouse in the above map. 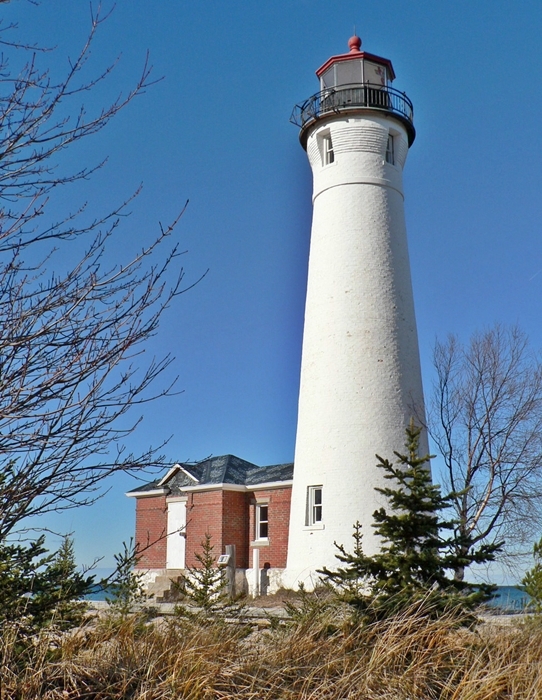 For detailed directions, including helpful photographs and odometer readings, visit the Crisp Point Light Historical Society website. Please note that it is an eighteen-mile-long journey on a dirt road to reach the lighthouse. Also, if you are coming from Paradise, Michigan, your GPS may take you down an incorrect road. Make sure your turn off of M-123 is onto Luce County Road 500. Crisp Point Lighthouse is open daily from 10 a.m. to 6:00 p.m. from Memorial Day weekend through mid-October. Call (517) 230-6294 for more information. 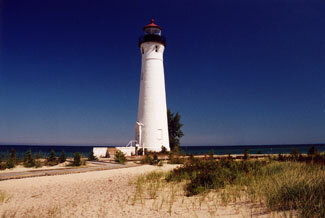 The lighthouse is owned by Luce County. Grounds open, tower open in season. Visiting Crisp Point Lighthouse during the winter with a vehicle should not be attempted. I aborted a trip to reach the lighthouse around New Years one winter after finding the road impassable. 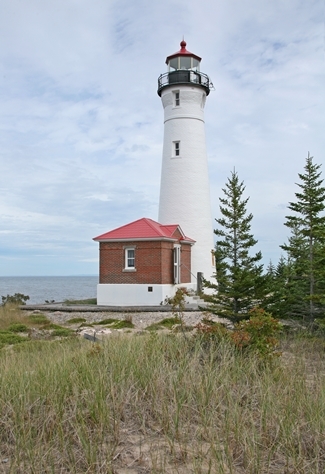 In April 2015, Lee Wright and Leslie Roy, two sisters in their fifties, attempted to reach the lighthouse after having visited family members in the Upper Peninsula and became stranded in their Ford Explorer, three miles west of the lighthouse. The pair wisely donned multiple layers of clothing and then subsisted on Cheetos, eight boxes of Girl Scout Cookies, and water from snow for thirteen days before being spotted by rescuers. 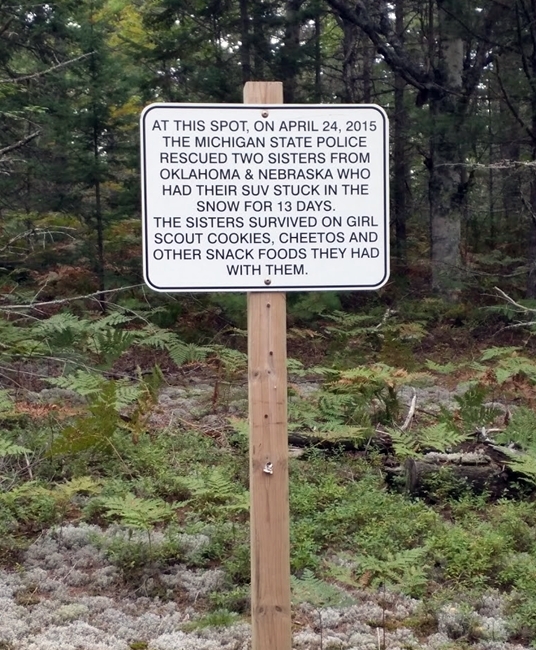 While they did have cell phones, there was no service in the area. During their ordeal, a bear visited their vehicle on two nights. A sergeant flying in a helicopter with three other rescuers was alerted to the vehicle's presence by a glint from its windshield. The sisters were in remarkably good condition and spirits when they were rescued, but were still taken to a local hospital as a precautionary measure. The sisters returned to the Upper Peninsula in August 2016 to thank their rescuers and to visit the lighthouse they were unable to reach. During their visit, the sisters signed a post that displays a sign marking the spot where the women were rescued. Signs posted along the road alert travellers that a satellite phone is now kept at Crisp Point Lighthouse for emergency use.